Just an update for you all – as you are probably aware, we are working on updating the swatches for everyone online and this is well underway! As well as a shot of the product in the component and a zoomed in shot of the product itself, I am personally swatching [with the help of Halimah!] every product on skin to give you all as clear an idea of the product finish, colour and texture as possible! Above is Lipstick in ‘Diablo’. Above is Lipstick in ‘Maneater’. Above is Lipstick in ‘Brink’. One great thing about doing this is that I get to try on colours that I would never normally wear and guess what? 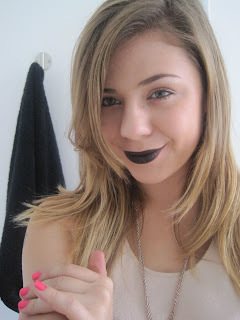 I am LOVING Lipstick in ‘Pristine’ – a glossy, dramatically pigmented black lipstick.